Coming soon - Softcover edition available from early April, hardcover from late April. Pre publication orders not necessary. The Fourth Edition of Orchids of South~West Australia is a major revision of this States 438 species, of which 70 have been officially named since the Third Edition. Also included in this edition are 20 named hybrids and a selection of unnamed hybrids. The information contains up to date descriptions and many new photos. Measurements, flowering periods and distribution maps by courtesy of the Western Australian Herbarium are provided. The book includes a glossary, bibliography and indexes to the scientific and common names. 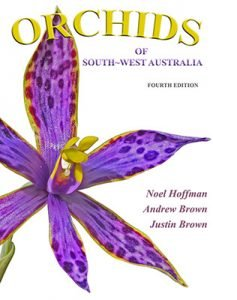 The people of Western Australia and tourists to the State will be fascinated by Orchids of South-West Australia by Noel Hoffman, Andrew Brown and Justin Brown. The principle purpose of this book is to provide an accurate and easy means of identifying the native orchids of this region. There is an excellent description of each orchid in which the distinctive features of each species and information on distribution, habitat, flowering period and the common name is provided. For every orchid there is also a colour photograph and map of its distribution. Orchids of South-West Australia is a must for all professional and amateur orchidologists.